3. Enjoy your more active lifestyle! Our therapists help you recover from injury, surgery and/or manage chronic conditions with the use of hands on treatments and exercise prescription. Feel more calm and have more energy as we combine traditional Physiotherapy with the holistic benefits of Medical Yoga Therapy. Do more of the things you used to enjoy as your pain decreases& your strength and balance returns. Most people experience some pretty significant physical pain and mental stress in their life. 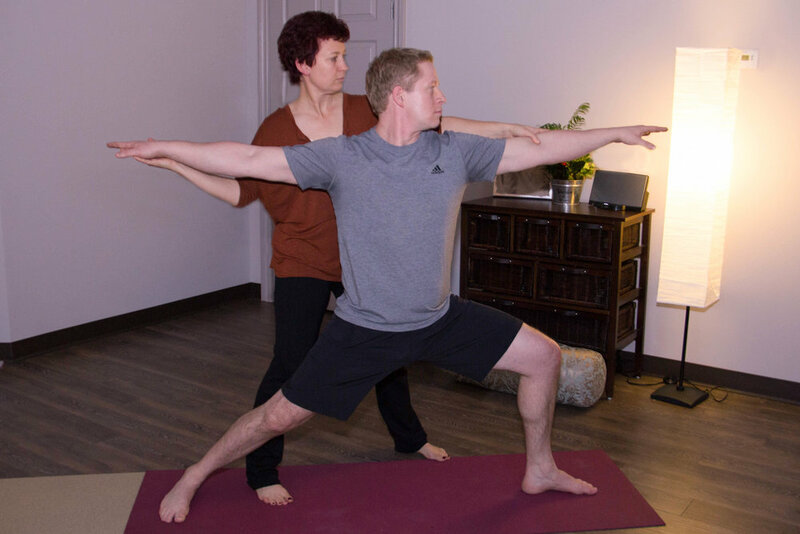 At Saskatoon PhysioYoga, we blend traditional Physiotherapy with the holistic benefits of Medical Yoga Therapy to foster a deeper and more meaningful level of healing that helps you recharge, recover and rebuild your healthy lifestyle. We make it easy for you to recover, rebuild and recharge. We understand how scary it feels to have pain that slows you down or stops you from doing what you enjoy. You are not alone! Many people just like you have come to us with these same fears. That’s why we take a unique approach to your care. By blending the physical healing of Physiotherapy together with the holistic benefits of Medical Yoga Therapy, we create a more balanced path to a healthy lifestyle for you. We find people who complete their treatment path this way enjoy more confidence to return to the activities they used to enjoy and the courage to try new things. Prior to becoming a Physiotherapist in 1999, Linda Boryski competed at a national level in four different sports and medalled in two. She brings that same commitment to excellence and team work to Saskatoon PhysioYoga. Linda chose to elevate her Physiotherapy practice by completing her Professional Yoga Therapy certification, the first in Saskatchewan and one of only five in Canada. Linda empowers independer learners, especially those who are proactive with their health and ready to go “ALL IN”. She guides them to take control of their lives, to make the changes they know they can make and live the life they desire. Even at a very young age, Shaunda was helping people. From age 12 to present day, Shaunda teaches Ukrainian dance, leading dancers to festivals and performances worldwide. With her drive for continuous learning, it was natural to combine her love of dance and teaching with her desire to help others by pursuing a career in Physiotherapy. Shaunda brings 7 years of Physiotherapy experience to Saskatoon PhysioYoga. With her strong teaching skills both in the treatment room and studio, Shaunda loves using SPY’s unique blend of Physiotherapy and Medical Yoga Therapy, to help her clients on a deeper level. She is driven to bring a sense of balance to those who are keen to help themselves live a healthful and wholehearted life. All you want is to feel healthy, be active with your family and not be a burden to them as you age. The problem is you are in pain, you feel stiff and these things are starting to slow you down…. Yoga should be available to everybody and every body. There’s so much information out there…how do I know what to believe??? Have you ever thought about making a positive change and then get so overwhelmed with all the information, you just don’t know where to start? Are you confused because you don’t know what is true? Perhaps you’ve gotten so frustrated that you end up doing nothing at all?? We understand how troubling all this information can be. Most people experience significant pain and stress in their life. recharge, recover and rebuild your healthy life.